What does it need to become a great player? You’ll have to play a lot, to practice your instrument, to know your music theory and do music theory exercises. Well, that sounds a bit boring, doesn’t it? But the good news is: it doesn’t have to be boring or difficult! The basic music theory is explained in detail from the very beginning to an intermediate level. So, whether you’re a total beginner in music (theory) or already a bit more advanced: you will find what you need to have you up and running when you’re playing or learning to play your favorite instrument. Each category consists of several lessons. At the end of a lesson, you will find links to recommended interactive exercises that go with that lesson (see below). We don’t stop at the intermediate level of the basic music theory as explained above. We also have an advanced jazz theory course. What would theory lessons be without the possibility to do exercises to train yourself? That’s why you will find lots of interactive music theory exercises that will help you to not only test your knowledge, but also to master the theory better. Moreover, the exercises are fun to do and not boring like the more traditional exercises. The exercises are divided into the same 4 categories as the theory lessons. When you get the habit of doing 5 or 10 minutes of exercises every day, you skills and knowledge will improve in giant steps. Go from a total beginner on the piano to a good intermediate level piano player with our amazing piano course. These online piano lessons for adults and kids let you practice the notes in a scale in a fun way: you play the scale notes in the melody of a (known) song together with a play along track instead of only endlessly running up and down the scale. You will also learn basic music theory, reading music and the basics of improvising using the pentatonic and the blues scale. All of this in 15.5 hours of video and plenty of articles and play along tracks. Join the 4k+ students already enrolled in this course with a 4.5 star rating (out of 5). Not for the original price of 199.99$, but now with 95% off: only 9.99$!!! Check out reviews and sample lessons of this piano course here. Then it’s important to know how it all works. This jazz theory course is for all instrumentalists and explains in detail about jazz chords and scales. Major scale theory, melodic minor scale theory, diminished and whole tone scale theory, pentatonic and blues scale, bebop scale, playing outside the scale, basic reharmonization and much more. More than 4.5 hours of video. Join the more than 600 students already enrolled in this course with a 4.4 star rating (out of 5). All of this for only 9.99$ instead of the normal price of 99.99$. Check out reviews and sample lessons of our jazz theory course here. More than 3 hours of video. Join the almost 200 students already enrolled in this course with a 4.7 star rating (out of 5). All of this for only 9.99$ instead of the normal price of 59.99$. With MuseScore, you can create professional sheet music and even whole songbooks or fakebooks. The built-in playback function makes MuseScore an unmissable tool for music composers and you can therefore also use it to write accompaniment music to practice your instrument. And the great thing about MuseScore is: it is totally FREE! Our 4.5 hours video course learns you all the ins and outs of this amazing program. Join the 1k+ students already enrolled in this course with a 4.7 star rating (out of 5). Not for the original price of 64.99$, but now for only 9.99$!!! Check out reviews and sample lessons of our MuseScore course here. You will find all our courses on the music courses-page. Do you play the guitar? The bass? The saxophone? Do you sing? Or do you play any other instrument? Then, this site is also for you. The only thing you should know, are the notes on a piano, but this is clearly explained in the first theory lesson. When you know this, you’re good to go for all the other music theory lessons and exercises. By the way, did you know that any other instrumentalist should at least know the basics of the piano? This is, because the piano is probably the instrument with the best visual representation of the notes. At a glance you can see the notes with a sharp or flat (the black keys) or the ones without (the white keys). Also, the piano is one of the best instruments to compose a song on. 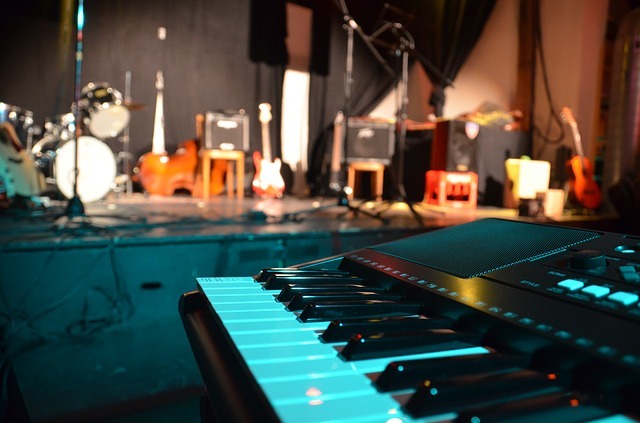 You can connect an electronic keyboard to the computer and work with a digital workstation and make a whole band on your own (also good for composing).